Service Rep Foggy Window Repair Kit plus 6mo. Client Website FREE! These kits are designed for the foggy window repair service representative; as a trades person who will be carrying out foggy window repairs on a regular basis who wishes to start up a profitable new business. For a limited time only, we are offering as a bonus, a WINDOW COMPANY Website and Lead Generator FREE for 6 months! This window defogging kit provides all the tools needed to repair standard, laminated, toughened or tempered glass double paned foggy windows including foggy patio doors, much more professionally and efficiently than the Basic and Advanced (DIY) kits. Plus, the equipment needed to carry out repairs from the inside of the property if access is a problem. Service Representative kit with enough stock to repair up to 50 units, including patio doors (tempered glass), plus as a bonus, a WINDOW COMPANY Website and Lead Generator FREE for 6 months! - two (2) custom Dremel water coolant sprayers, two (2) long reach drill bits, twelve (12) drilling templates, twelve (12) glass drill bits, three (3) 2 gallon/8 liter solution sprayers, three (3) 20 foot solution sprayer hoses, three (3) solution sprayer blow guns, three (3) 6 inch solution sprayer blow gun extensions with 90 degree sprayer tips, additional 90 degree sprayer tip, one (1) patio door (tempered glass) sprayer wand, 20 foot solution removal tubing with primer, (all components washing & rinsing solution resistant), spacer bar desiccant sealer applicator with extension tubing, one hundred (100) venting plugs, twenty (20) inside venting plugs. Step by Step Instructions. Tips on Do’s and Don’ts. Plus email & telephone support. Includes a FREE ($169) Online Service Representative Product Information Kit! Bonus Limited Time Offer! FREE 6 months UNITED STATES WINDOW COMPANY Website & Lead Generator with the purchase of a Service Representative Kit ...a $150(USD) VALUE ADDED! Click here to learn more and to Contact Us before you buy the Service Representative Kit. Bonus Limited Time Offer! FREE 6 months CANADIAN WINDOW COMPANY Website & Lead Generator with the purchase of a Service Representative Kit ...a $150(CAD) VALUE ADDED! 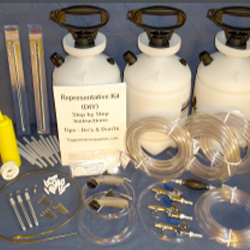 Click here to learn more and to Contact Us before you buy the Service Representative Kit. Or buy the Service Representative Foggy Window Seal Repair Kit right now and we will contact you to set up your FREE 6 months Professional WINDOW COMPANY Website & Lead Generator! A Dremel Rotary Drilling Tool - Commonly found at your local hardware store. The Washing Solution - Commonly found at your local department and hardware stores. Completely non-toxic and anti-bacterial, the name of this solution is included with your instructions. It works quickly to break down the kind of film and calcium deposits that frequently accumulate on the inside of the failed double paned glass window surfaces. At less than $5 / gallon, 4 gallons or 16 liters will be enough to repair up to 50 units. The Rinsing Solution - Commonly found at your local hardware store. The name of this solution is included with your instructions. It will flow over the glass surfaces evenly to remove any of the remaining washing solution and water droplets, assist in the drying process, and leave the window clean with no residue. At roughly $10 / gallon, 4 gallons or 16 liters will be enough to repair up to 50 units. Spacer Bar Desiccant Sealer - Commonly found at your local hardware store. The name of this solution is included with your instructions. It will seal and prevent moisture accumulation within the desiccant of the bottom spacer bar. At roughly $20 per quart/liter, two quarts or two liters will be enough to repair up to 50 units.